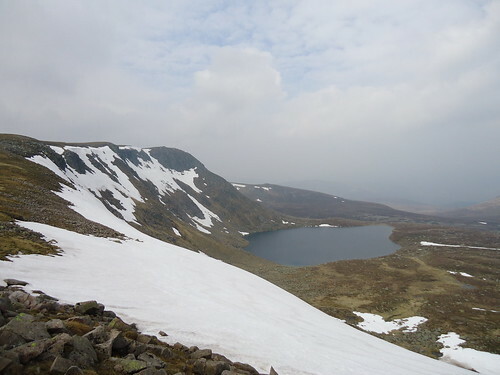 Fresh off the back of a walk on the Ben Lawers ridge, I decided to go and complete the East Mounth with a walk up Carn an t-Sagairt Mor, Carn a'Choire Bhoidheach and the Lochnagar from Auchallater. (The reason for the report's title will be explained in due course). 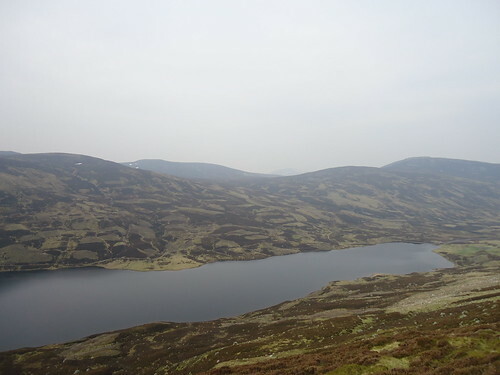 So I set off from the carpark at Auchallater, from which a large track leads up Glen Callater, following the Callater Burn, to the Lochcallater lodge (0h50m). 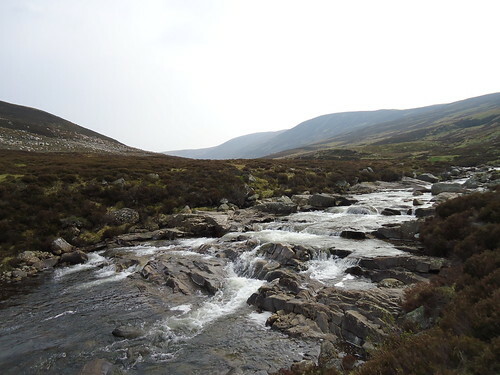 The glen is stunning, and has a surprising feeling of remoteness, partly because, as I later learned, the overwhelming majority of walkers approach Lochnagar from Glen Muick, leaving this route fairly quiet. 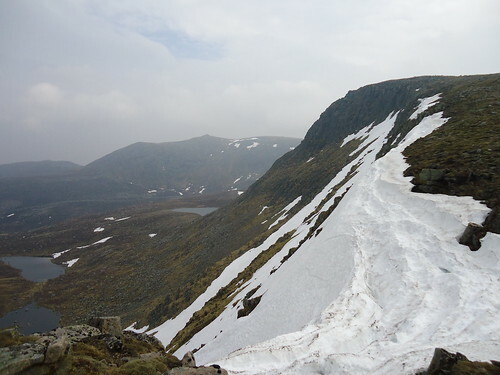 A nice path leads up the hillside from the lodge, and all the way round to just below the first summit, Carn an t-Sagairt Mor (2h00m). 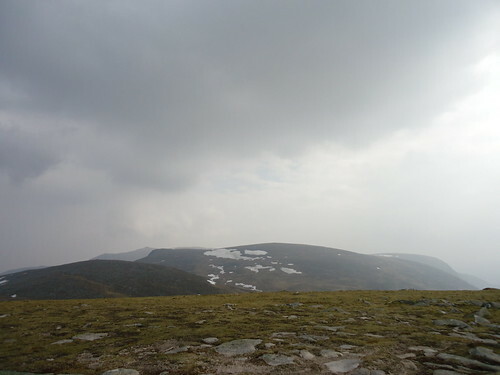 A short walk off of the path was the summit, from which there were good views of Carn an Tuirc to the South and the remaining summits of the day. 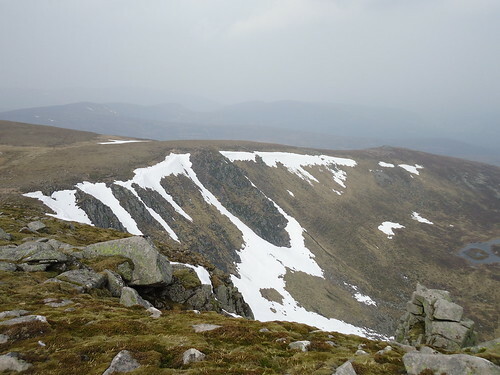 From the summit, unable to resist the temptation to have a peek at the crags below The Stuic, I descended down a grassy slope to the NE towards Carn an t-Sagairt Beag (a smaller mound between t-Sagairt Mor and The Stuic). 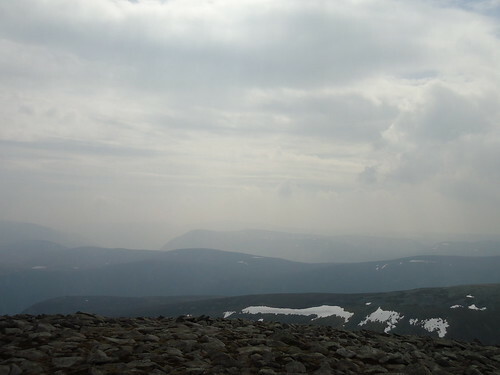 A plateau led across from the smaller hill's summit towards the crags of The Stuic. 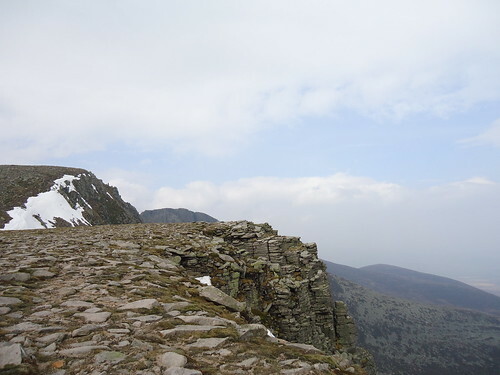 Stunning views of the crags and cornices made the detour 100% worthwhile. 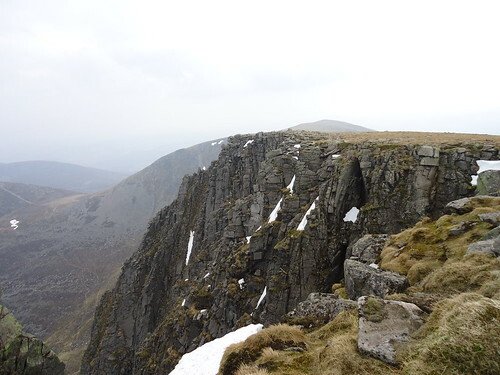 Following the edge of the corrie to the top of The Stuic, a quick pop across easy terrain brought me to the second summit, Carn a'Choire Bhoidheach (2h45m). 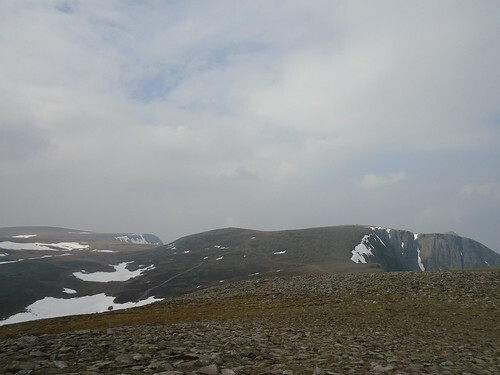 From this summit, I rejoined the edge of the corrie below The Stuic, getting some fantastic views again, this time from the other side. 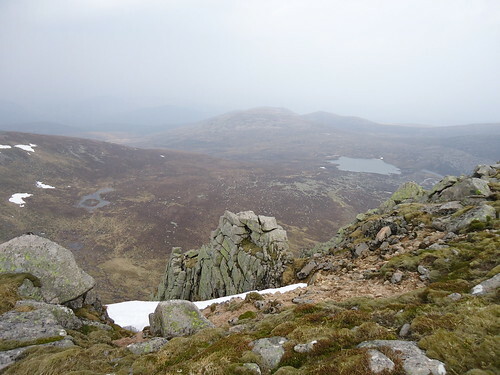 My route eventually collided with the main path leading up to both summits of Lochnagar (I reached the larger summit after 3h30m). 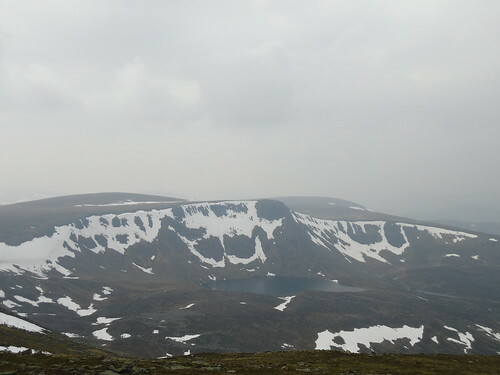 With my legs still feeling alright and great visibility, I decided to take (yet another) detour towards the mound at the SE end of the Lochnagar corrie - Cuidhe Crom. 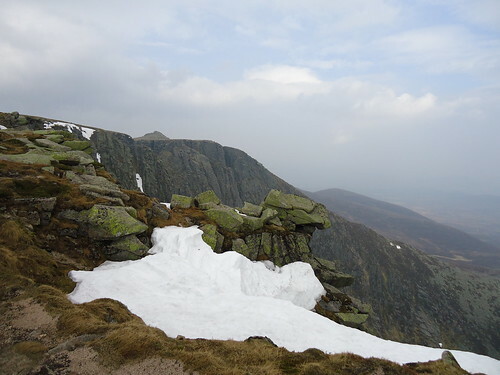 This was mainly to get some good views of the crags below the Lochnagar summit, as the grandeur of the cliffs cannot fully, in my opinion, be appreciated from the main Lochanagar summit. Following the edge of the corrie again, there were some fantastic views looking back towards the summit, and down into the corrie with it's stunning lochan. 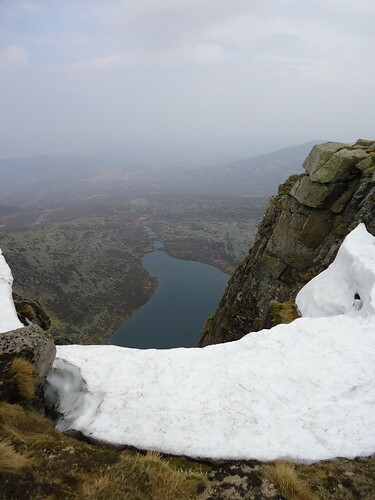 Cuidhe Crom (4h00m) actually provided a great spot for lunch - away from the crowded main summit of Lochnagar, and with some great views. 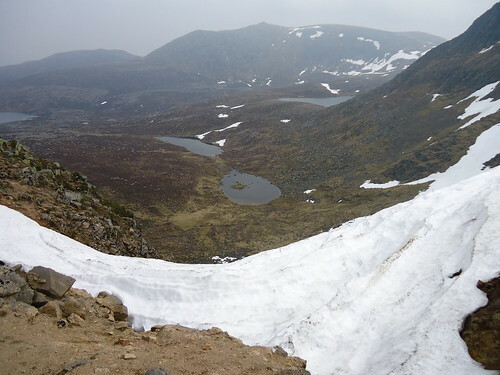 All that was left was a long trudge back to Glen Callater and the A85. 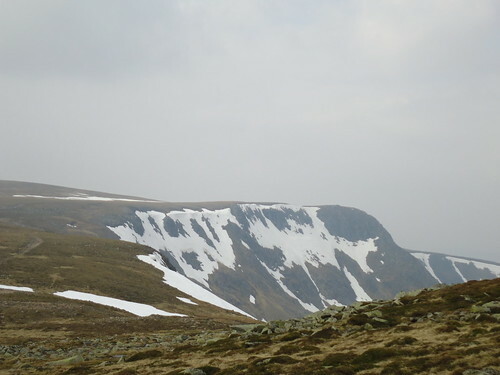 Nice grassy (and at times, boggy) slopes led all the way back round the southern edge of the Lochnagar summits, and eventually rejoined the main path passing The Stuic. 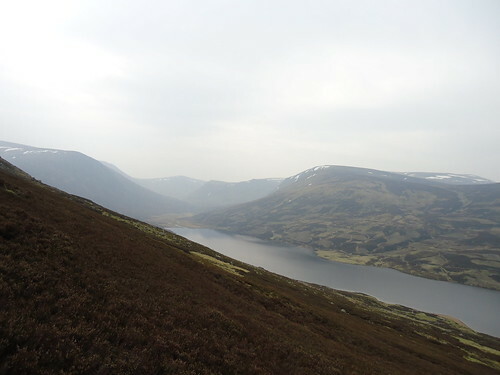 From here, it was a simple matter of following the path back below the two earlier Munro summits, and down to Glen Callater. Here came the most unusual part of the walk, however. 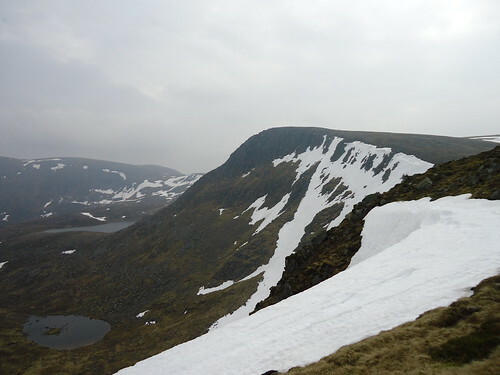 Having adjusted to seeing nobody on the Glen Callater route so far, it came as quite a surprise to see a figure heading up towards the first summit from Glen Callater (bearing in mind it was almost 3pm at this point). 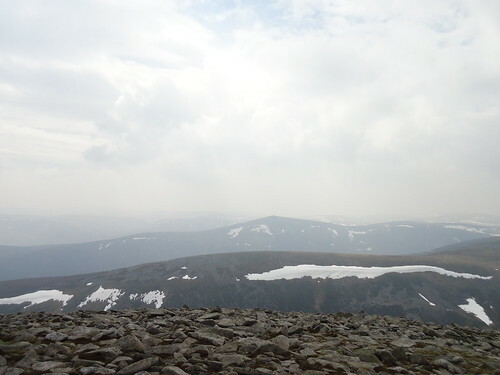 But, low and behold, it wasn't just any enthusiastic mountaineer, it was the heir to the throne, Prince Charles himself! 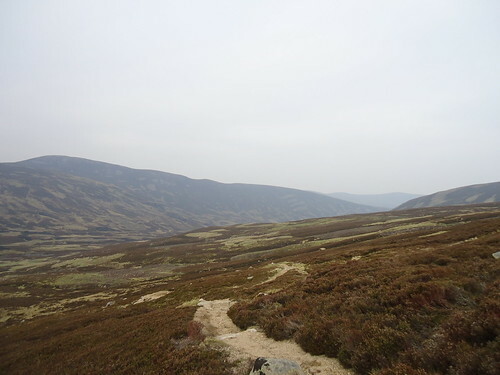 Whilst exchanging greetings with him on the path, I did (at least) a double-take - he was definitely not who I was expecting to see up in the hills, particularly completely on his own. 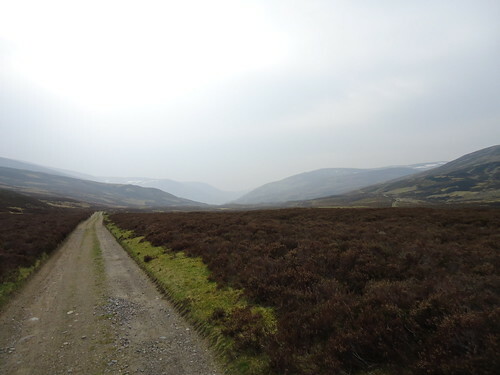 But I could imagine there would be no better escape from the media hubbub surrounding his family at the moment, than the fresh air and stunning scenery of this area. Still fresh with bewilderment, I reached the Lochcallater lodge after 6h15m. 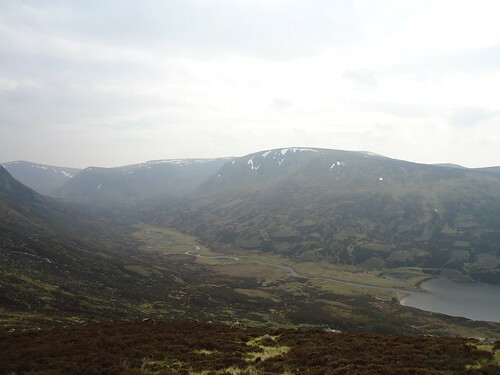 And from there it was a simple walk back along Glen Callater to the car park. A great walk overall - significantly longer than I originally anticipated (due mostly to my enthusiasm for detours). 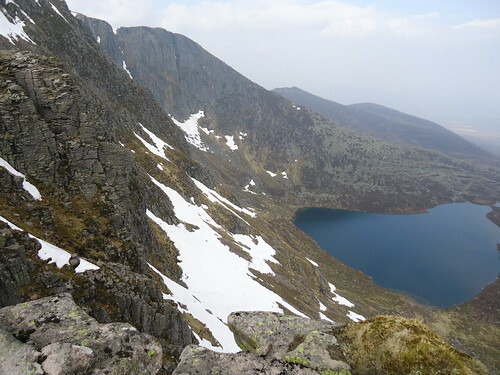 Still, I would recommend to anybody doing Lochnagar to approach it from this route - it provides a much less busy and more peaceful route, without sacrificing the quality of path or scenery. Last edited by joenorris on Wed May 18, 2011 9:47 am, edited 2 times in total. 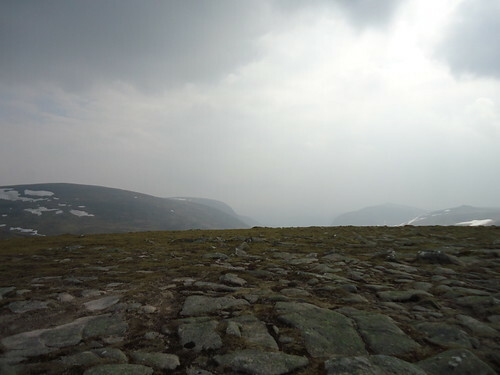 joenorris wrote: Having adjusted to seeing nobody on the Glen Callater route so far, it came as quite a surprise to see a figure heading up towards the first summit from Glen Callater (bearing in mind it was almost 3pm at this point). But, low and behold, it wasn't just any enthusiastic mountaineer, it was the heir to the throne, Prince Charles himself! Whilst exchanging greetings with him on the path, I did (at least) a double-take - he was definitely not who I was expecting to see up in the hills, particularly completely on his own. 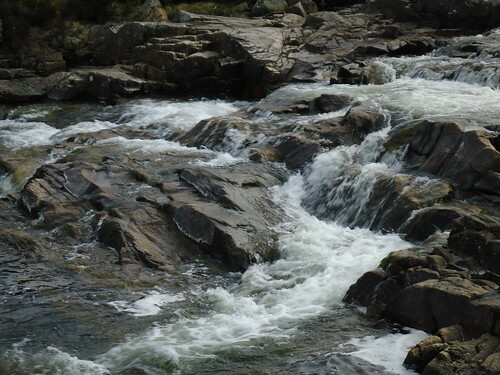 But I could imagine there would be no better escape from the media hubbub surrounding his family at the moment, than the fresh air and stunning scenery of this area. But how many snipers would there be hiding in the hills watching you say hello to the future King?? Are his ears as big as they look? To be honest, he was pretty much the spitting image of the caricatured cartoons you see in the newspapers - red face, big ears and very mumbly voice! And I was conscious that somebody somewhere was probably watching through binoculars, or a satellite feed! Still, good to see he's out and about. Glad the report is helpful, Chris, let us know how your interpretation of the route goes!